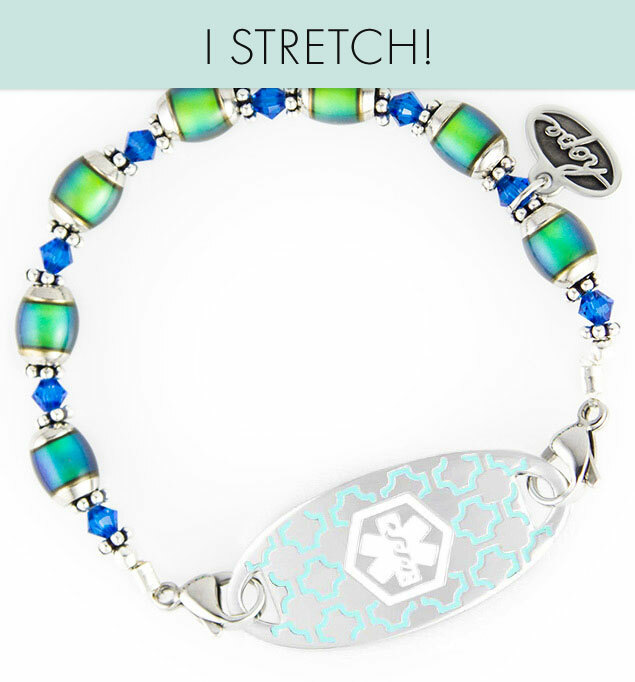 Our Mood Bead Stretch Medical ID Bracelet has all the fun color-changing and interchangeability of our classic Mood Bead Medical ID with one added benefit: it stretches! As with all of our Stretch Medical ID Bracelets, these interchangeable designs are hand-stranded on high quality elastic, giving you exactly the look you want while allowing you to put your bracelet on over your hand: no clasping necessary! The Mood Bead Stretch is made with fun color-changing mood beads. We’ll even send you a fun little “mood reader” card to go with it. Between the mood beads, we have bright blue crystals and sterling silver balis for a sparkly look that’s really fun to wear. Pair your Mood Bead Stretch Medical ID Bracelet with any of our custom-engravable medical ID tags. They feature the internationally recognized medical caduceus symbol on the front, which alerts medical personnel to your information, engraved on the back.